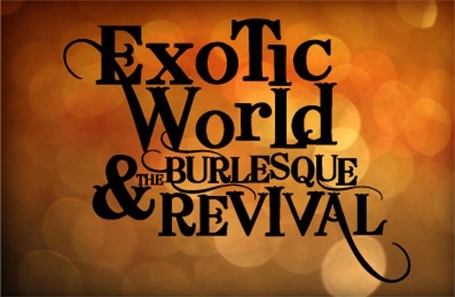 Exotic World and The Burlesque Revival on the big screen. Cupcakes & Apple Pie in Seattle. Be a part of history- 10 days left! Everyone who attended the Burlesque Hall of Fame 2011 came away with a very important film fixation: Exotic World and the Burlesque Revival. Anyone who has made the pilgrimage to the annual Vegas gathering ever can attest to the power of the museum as a tool to not only preserve history, but to make it: Dixie Evans and before her, Jennie Lee, threw the doors wide open for legions of performers to follow in their footsteps, and find each other. This movie is important to the international burlesque community in so many ways, and only 10 days remain in the campaign to help fund the project’s finishing costs (mastering, archival footage, music licensing, and color correction). Read more about the film HERE– and please, for the love of all that is dazzling, donate! A Celebratory Reception for the newly crowned Reigning Queen of Burlesque, Miss Indigo Blue, and for those from Seattle who performed this year at the Burlesque Hall of Fame Weekend. Seattle-based international burlesque sensation Miss Indigo Blue, “The Twirly Girl,” has been crowned the Reigning Queen of Burlesque at the Burlesque Hall of Fame Reunion and Pageant in Las Vegas, Nevada. The newly named Queen, officially “Miss Exotic World 2011” took home a tiara and a 3-foot tall trophy for her win, and a second trophy for the “Most Classic” award. In addition to Miss Indigo Blue’s win, five other Burlesque performers from Seattle performed at the event. Lily Verlaine won 2nd Runner Up, and Randi Rascal and Iva Handfull both competed in the Best Debut category. Inga Ingenue and Waxie Moon were also featured in the Thursday Night “Innovators” Showcase. This reception honors of all of Seattle’s illustrious ecdysiasts that performed at BHoF, and will be held this Saturday July 2, from 2-5 pm at The Academy of Burlesque’s home in the West Hall of the Oddfellows Bldg at 915 E Pine St. The reception is free, but donations for Exotic World: The Movie *AND* The Burlesque Hall of Fame will be gratefully accepted. The Tin Table will open early for the event, and celebratory cupcakes wil be provided in West Hall while DJ Status Apparatus spins hot tunes. During the event, two Burlesque Hall of Fame Weekend slideshows will be displayed by Academy Alumni Paul O’Connell and Ruby Whiines. Also, there will be a press photo op, as well as opportunities for attendees have pictures taken with the Queen and her Trophy and with the other BHoF performers. This will also be the International Premiere of “The Queen’s Edict”, the first of 12 monthly videos that Indigo Blue will present as Reigning Queen of Burlesque. Accurate Facebook RSVP’s are requested to ensure sufficient cupcakes. Place: West Hall, Oddfellows Bldg, 915 E Pine St.
Freedom Fantasia: this weekend at West Hall. ~ by angrytruffle on 07/01/2011. I’m making my donation now!